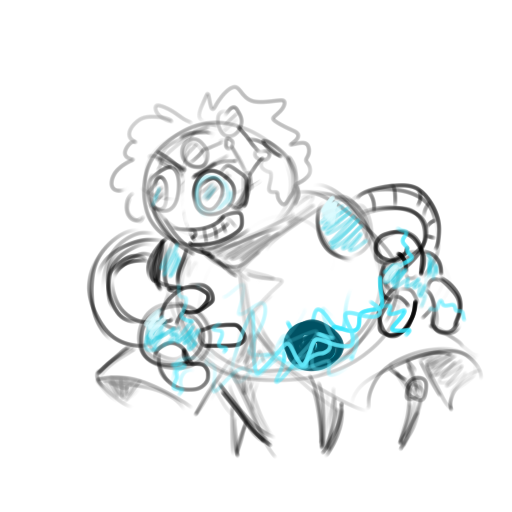 A group of robots is infected by a powerful virus that causes them to go mayhem! The blame is put on you, Copy, and now it's your job to capture them and stop the virus. 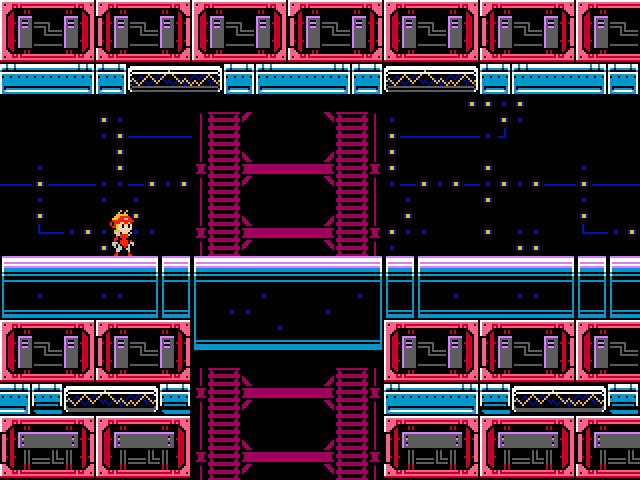 Copy Girl follows the base mechanics of a Mega Man game, while innovating whenever possible. There are 8 levels and bosses, and you get a new weapon from defeating each boss. Located in an old chemical plant, Stain's guided by some kind of twisted perception of beauty. His paint smells like trouble, so be careful. Ink Bubble: Fires corrosive blobs of paint that bounce on walls, reaching into every nook and cranny. Fuze has taken a big chunk of the city as her own domain. Now the highways aren't safe anymore, as she and her gang ride at full throttle, blasting their music for anyone crazy enough to come near. Sound Barrier: Creates a sound wave that echoes off obstacles, increasing in power. A precious girl that appears to be very shy. She commands the creatures of the ocean, so it's better not to provoke her. Penta Pearl: Forms a rotating shield of pearls around you. It can be activated to reach targets in every direction. You know what? I like retro games, and I like Mega Man (can you tell?) So I decided to make a Mega Man clone. Weapons are cool - All weapons will be useful in a number of situations, and the player can play around with them to overcome challenges. 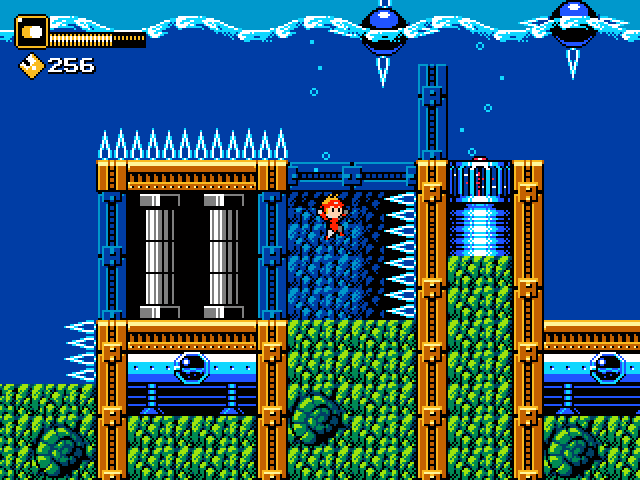 No boss weakness - One of the things that sold Mega Man back then was the possibility to play any level in any order. Sounds great! But when comes down to it, it creates an underlying optimal order if you want to actually beat the bosses. Having the optimal weapon created a huge difficulty drop. Here you'll choose the weapon based on your own strategy and on observing the boss' patterns. No weapon is required, but instead create a new way to approach the boss. Exploration - Secret areas and different paths will contain many awesome collectibles, such as weapon upgrades and health increasing capsules. Playing levels in different order can open different paths, revealing new challenges. Going fast - The game will have a number of challenge levels, where you can earn more in-game currency. This game's looking pretty slick, indeed. Nice work so far! - 2-player co-op sounds interesting. Do you plan on balancing the game for that case (i.e. more enemies, different enemy layouts, etc.)? - I'm not sure about dropping the boss weakness matter. If you wanted to defeat the bosses without using any additional weapons and just take the challenge, that was definitely possible in the original Mega Man games (and even suggested for at least a few bosses throughout the game). But then again, if the weapons are varied and useful enough, then maybe having no weaknesses wouldn't be so bad. But when comes down to it, it creates an underlying optimal order if you want to actually beat the boss. Having the optimal weapon created a huge difficulty drop. Glad to see that you started a devlog! What I want to know is were is the character/enemy/boss with a big red nose? Loving the Copy Girl logo design. Tip on how to animate: make stuff move! It's simple color theory. For instance, for the stage on those screenshots I picked gray as a neutral color and purple for the background (the theme of the level is chemicals and paint, so I though purple would fit). Then I picked green because it's a complementary color to purple. That first gif just got me! had to go through the whole thread. Great design. Love that turret, it packs a lot of punch. 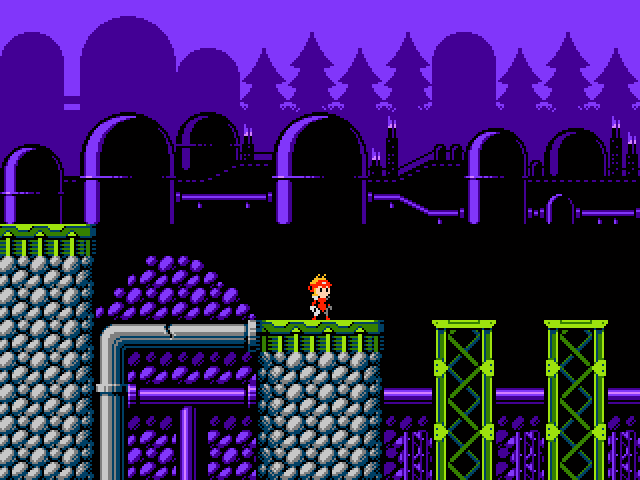 I made a little Mega Man clone myself (really just a clone which even used MM graphics), so I find this project very interesting. Can't wait to play it! Awesome. I so hope that "Endless Attack" is an idea included here, too. There is no such a thing as enough retro platformer games. I'm definitely following this!